One of the quintessential locales for adventurers to rest between adventures, a fort on the borderlands is a safe haven offering many of civilisation’s beguiling comforts. Here adventurers can rest and recuperate between expeditions into the wilderness. Use the table below, to determine what minor events the PCs experience as they move about within the fort’s walls. The clamour of sword striking sword and the grunts of warriors fighting foreshadows the sight of two fighters practising their craft. A particularly large raven squats on a tower’s battlements and watches folks’ coming and going with strange intensity. It flies off, if the PCs take particular note of its presence. Dark clouds scud across the sky, plunging the fort into shadow. Several travellers—the mud of the road fresh upon their boots—stagger passed the party in search of fresh ale, warm food and a comfortable bed for the night. A small boy—dirty and thin—darts through the crowd. He clutches a scabbarded longsword to his chest. The weapon appears finely made. If stopped, the boy—Arthal—explains he is delivering it to a customer of his father. A shout of alarm from one of the fort’s tower has several men-at-arms rushing to investigate whatever their companion has spotted. Two off-duty men-at-arms wearing naught but tunics and dirty tabards stagger along arm in arm. One waves a wineskin theatrically while singing a rather lewd song in a rich, baritone voice. The other seems to be on the verge of being sick. A pair of large horses pull a huge, heavily laden, creaking wagon through the fort’s gate. The wagon barely fits through the gate and its wheels scour deep groves in the muddy courtyard. A single man clad in a heavy cloak and wide-brimmed hat steers the horses with deft flicks of the reins. A mailed messenger on horseback canters passed the PCs on her way to the gate. She wears a sheathed longsword on one hip and has a haversack full of scrolls and other missives slung over her shoulder. Her saddlebags bulge with supplies, suggesting she is starting a long journey. A servant emerges from a tower carrying a chamber pot at arm’s length. She climbs the steps to the outer wall and then—surreptitiously—dumps the pot’s contents over the wall. A flag flying from one of the fort’s towers breaks free and drifts down to the ground. It lands in a particularly large patch of horse manure. Is this an omen for the fort’s fortunes? A mailed warrior walks a huge hound. The dog amiably trots along behind its master…until it catches the scent of something interesting in the air. Nearby, a cat breaks from cover and darts off. A few seconds later, the dog bursts into action and gives chase leaving the warrior—shouting loudly and impotently—alone. A sudden gust of wind catches the fort’s various flags and pennants—they stream out proudly before the wind drops again. Laughter and singing float through an open window. It sounds like the people inside are in excellent spirits. A patrol of muddy, tired men-at-arms returns to the keep after spending three days patrolling the local roads. Led by a mounted officer, the men make their way directly to the barracks. They desire food and ale; anyone who gets in their way—perhaps an adventurer asking irritating questions about their patrol—is likely to get short shrift. A cowled figure lurks in a shadowy doorway, seemingly watching the PCs. If accosted, the man protests his innocence maintaining he was merely lost in thought. A wagon stacked high with firewood harvested from the surrounds stands near the fort’s kitchens. Three servants are busy unpacking the wood and stacking it in a nearby crude wood store. A peasant and his daughter drive a half-dozen sheep into the courtyard; two barking dogs dart about the small flock keeping it together. If asked, the peasants explain the sheep are destined for slaughter and then the kitchens. It is time for the changing of the guard. For a brief period, there are twice as many men-at-arms on the walls and at the front gate as normal. Half an hour after the watch changes, the tavern gets unsurprisingly busy. This article appears in 20 Things #20: Fort on the Borderlands. Thank you for subscribing to our newsletter. I hope you enjoy it, but remember if you don't you can unsubscribe at any time. Your discount code is RSP25. 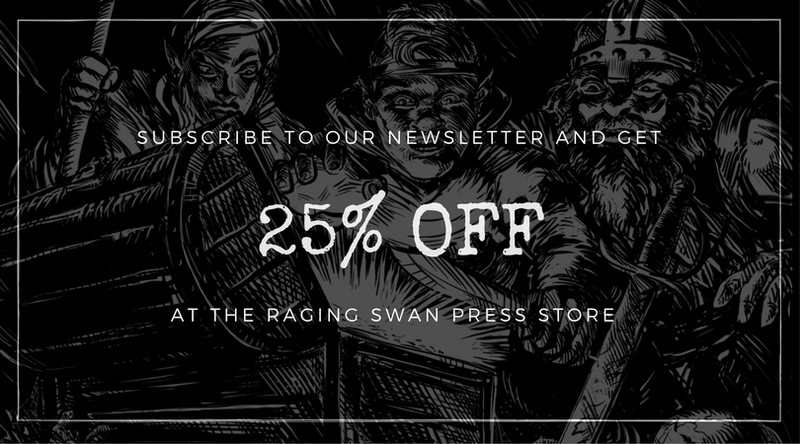 Enter it at https://ragingswan.shop to get 25% off your first order!